Introduction: This study demonstrates the effectiveness of using a multi-functional miniature in vivo robot to perform complex tasks, such as intracorporeal suturing, through a single incision. Existing technologies for Laparoendoscopic Single-Site Surgery (LESS), such as articulating, bent, and flexible instrumentation, are limited in visualization and tissue manipulation capabilities by multiple tools working through a single access point. A robotic platform that is completely inserted into the peritoneal cavity through a single incision mitigates these constraints and provides a more intuitive approach than standard LESS methods. Methods: A robotic platform consisting of a miniature in vivo robot and a remote surgeon interface has been designed and built. The basic robot design consists of two arms each connected to a central body. The body of the robot contains a mounting assembly and a maneuverable camera pair that provides images to the remote surgeon interface. The robot arms have two degree-of freedom rotational shoulder and elbow joints. Each forearm is fitted with specialized grasper or cautery end effectors. These end effector tools can be interchanged depending on the particular task being performed. For example, when performing a cholecystectomy, the robot forearms are fitted with standard cautery and grasper end effectors. Then, for performing intracorporeal suturing, laparoscopic needle holders are used in place of the cautery and grasper end effectors. The surgeon interface, located remotely within the operating room, consists of a monitor, a foot pedal for locking and clutching, and two PHANTOM Omni® (SensAble, Woburn, MA) devices for manipulation of the robot arms. Results: This robot has been demonstrated in multiple non-survival procedures in a porcine model, including three cholecystectomies. All procedures were performed at the University of Nebraska Medical Center with experimental protocols approved by the institutional review committee. For each procedure, the robot was inserted and then mated with a mounting rod that was advanced through the insertion incision. This rod was used with an external supporting assembly mounted to the rails of the operating table. The surgeon at the user interface manipulated the robot to perform the cholecystectomy, with stapling of the cystic duct and supplementary retraction being performed with standard laparoscopic tools that were advanced into the peritoneal cavity through the incision. At completion of the cholecystectomy, the robot was removed from the peritoneal cavity and then fitted with needle holder end effectors. 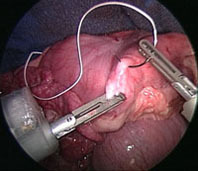 The robot was then reintroduced into the peritoneal cavity to successfully perform intracorporeal suturing of the bowel. Also, students performed benchtop tasks using both the robot platform and standard LESS. The results showed that the tasks were performed faster and more accurately using the robot. Conclusions: The widespread adoption of NOTES and LESS for complex surgeries is dependent on the development of devices that provide a stable multi-tasking platform. A multi-functional robot provides a completely insertable platform that addresses the triangulation and visualization limitations of existing instrumentation for LESS. The two degree-of-freedom rotational elbow joint enhanced surgical dexterity and enabled the performance of the complex surgical task of intracorporeal suturing with access through a single incision.